We were blessed with beautiful weather this week so we spent a lot of time playing outside (and as I get ready to post this, it's back to rainy, cold weather). 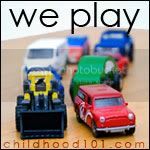 I hope you had some time to enjoy playing outdoors! This week Pinky learned all about our state in school (in preparation for our state's birthday this past Wednesday). It tied in perfectly to some map activities. 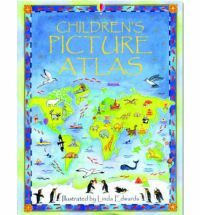 First we explored our new Usborne Children's Atlas. This book is a good intro to maps and different cultures. Both Pinky and Chaos had fun finding the different animals pictured in each country. For a more in depth map, Daddy printed out a giant map of all the parks in our city. The kids had a lot of fun trying to find our house based on landmarks (the lake, a big park, etc). We plan to use this map to mark all the places we've been on our playground tour. Pinky tried out a new book/game - Math Gear Addition. 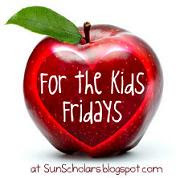 It's a neat book that quizzes kids on addition facts up to +12. Each page has a spinner so the child can change to first number that is being added. Once they've tried to find an answer they can lift the flap to see if they are correct. Pinky LOVED this book. I was amazed by how long she played with it. I think it will be a great book to take on long car trips to keep her busy. 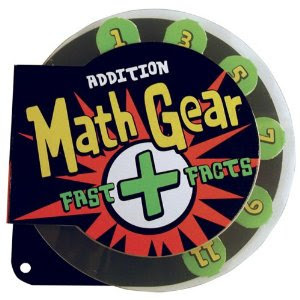 There are other versions of Math Gear too, and I may just pick up the subtraction book as well. 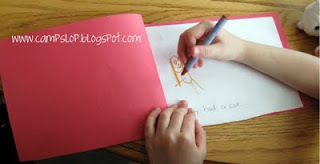 Inspired by this post at Living, Loving and Learning at Home, I decided to make Pinky her own BOB books to illustrate. 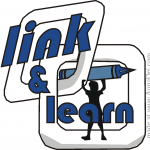 This activity combined her two favorite things - reading and drawing - so we may be doing more of this! "Pinky had a cat. The cat was sad. Pinky had a hat. The cat saw the hat. The cat had a hat. The cat was glad." "Pinky had a dog. Chaos had a dog. Wild One had a dog. Sprout had a dog. Mom and Dad had a dog. Dogs, dogs, dogs!" I decided to start the letter of the week with Chaos. 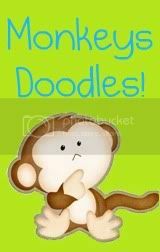 What's funny about Chaos is that he can tell you what the letters are for - he'll point to a P and say it's for Pinky, a C for Chaos, etc - but he can't actually name the letters. 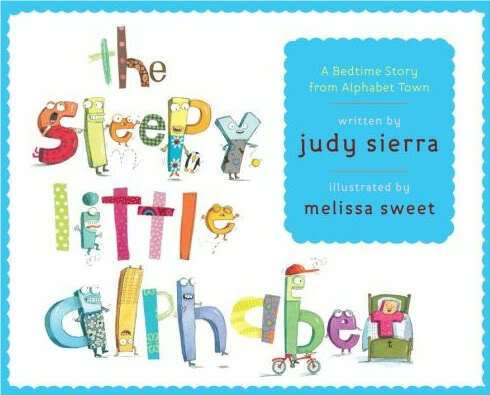 We started by reading The Sleepy Little Alphabet. It's a cute book about putting all of the letters to bed at night. 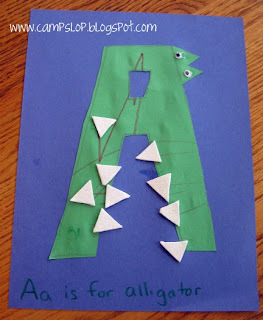 Next, we made an Alligator A (from this post on No Time for Flashcards). We even gave the alligator glittery teeth! I was really happy that Choas made this (and surprised at how good his scissor skills are!) because he is not usually interested in crafts. He's very excited to make the whole alphabet and hang it up in his room. 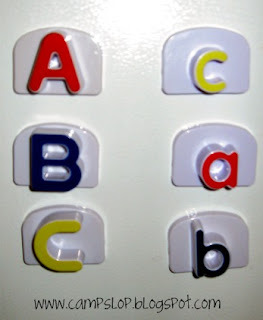 I also added some alphabet magnets to the fridge for him to explore. I selected A, B, and C (with lowercase magnets to match) to start with. 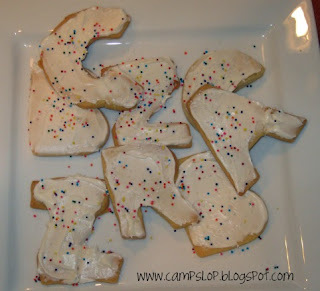 Finally, the most favorite activity of the week (for all of us), Alphabet Cookies!! 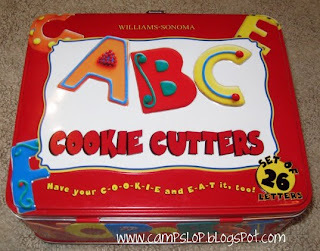 I found this adorable alphabet cookie cutter set at a garage sale and was excited to try it out. 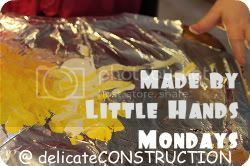 We had so much fun frosting and decorating these (and eating them too of course!). Chaos tried his hand at sorting shapes and colors this week. I printed these shape mats from Confessions of a Homeschooler and had Chaos sort plastic buttons according to shape. He did pretty well (I was surprised that he knew the difference between a circle and an oval). 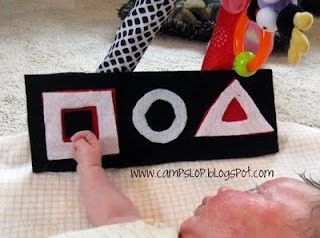 The rectangles/squares confused him, but I know he'll get it soon enough. Later we tried sorting by color, but he got frustrated, so we stopped. 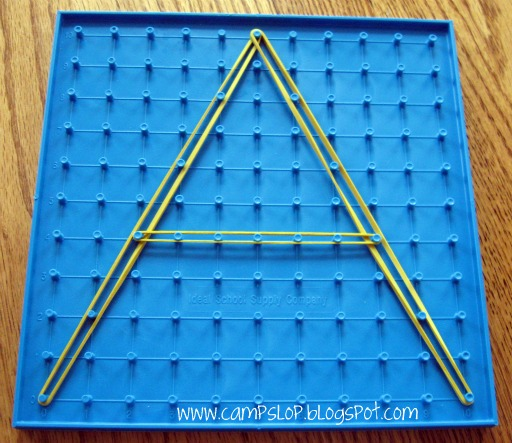 We also used our new geoboard for the first time this week. Pinky and Chaos had fun making shapes while I used it show the kids how to make letters. I hope to spend more time playing with this next week. Wild One spent a lot of time playing with Chaos's Chuck E Cheese tokens. She loved to put them in the jar one by one and then dump them all back out and start over. It's the simple things, right? As usual, she also spent a lot of time reading. I think she would be happy to read every minute of the day. 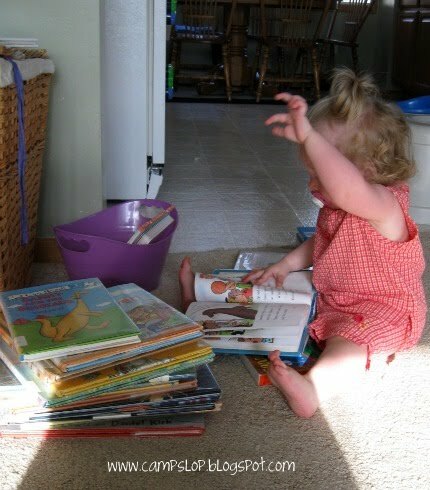 I'm glad that she occasionally gives me a break and looks at books by herself too! 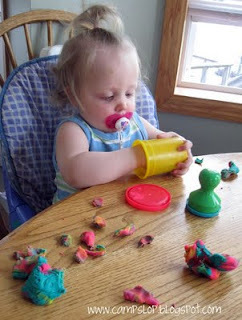 I introduced PlayDoh to her for the first time this week. She did so well! 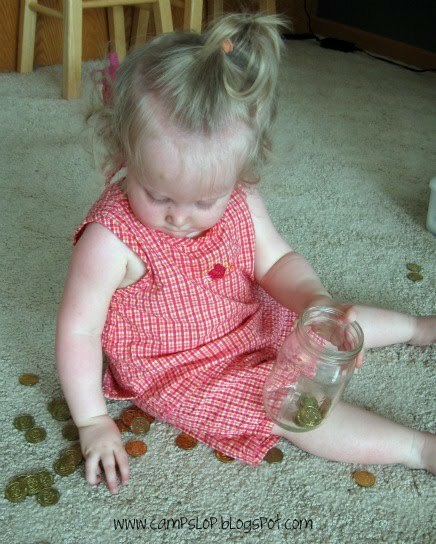 Much like the coins, she liked to dump it out and put it back in the jar, but she also had fun tearing it into little pieces. I gave her a stamper to try and was surprised that she had enough strength to make the stamp (a fish) show up! Sprout has been spending a lot of time on her play mat these days so I made her her own felt board to look at (the instructions can be found at this post on Made by Joel) . 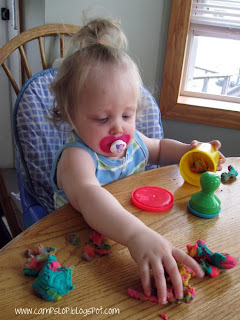 It was super quick and easy to make and the kids had fun switching out the shapes and colors for her. 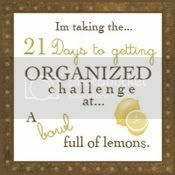 What fun activities did you do this week? I like your homemade Bob books. I might want to copy that! My daughter was just drawing up her own story this week. Your cookies look absolutely delicious! We love alphabet cookies, they are such a great way to explore letters and learning! Brilliant! 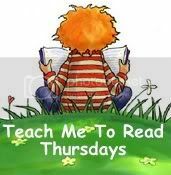 Thanks for linking up to Teach Me To Read Thursdays! 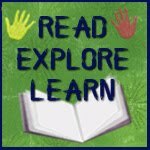 I love the homemade BOB books! Wow, you are busy, busy! 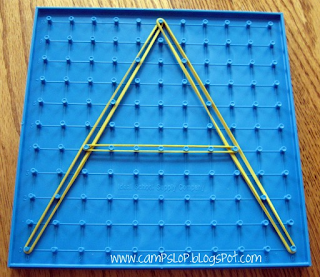 I love the geoboard - I've been meaning to get (or make) one of these. 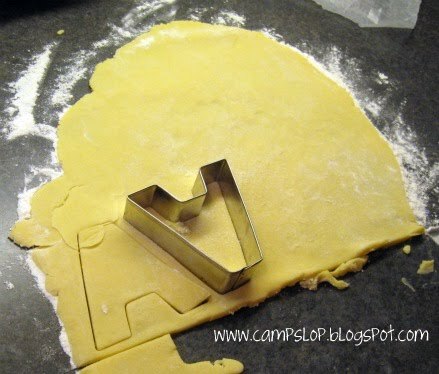 And cute cookies. 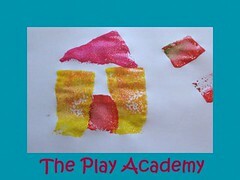 Thanks for linking up with the Play Academy.